There were several successors to the ABC800, most notably the ABC802 with built-in small 9" monitor and the ABC806 with more memory and more advanced 512x240x16 graphics. 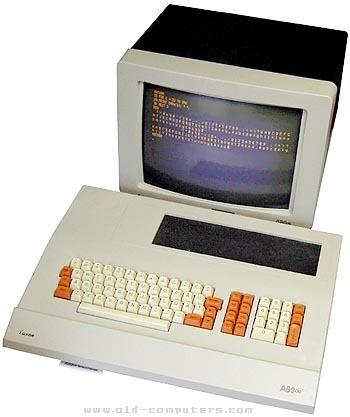 The ABC 800 series was also sold by Facit under the DTC (DeskTop Computer) name, in a darker enclosure. The Luxor I owned was a Luxor 802 And it didn't look like the one on the picture. The monitor was smalller, made in a metall thick enough to build a (small) house on. The CPU and the monitor was in one piece. The keyboard was connected on the back of the Monitor. The floppy-unit was also very stable I used it as a stepladder. OS consisted of a disk in the left 5.25" floppy. Start by "system" exit with "byebye" (uncertain). Very little sound, nice, and tidy. I had 2 with the original RS232 Matrisprinter. You could sharpen a knife on the chassis if you wanted. Special thanks to Martti Kunttu who donated us this computer ! see more Luxor ABC 800 Series Ebay auctions !